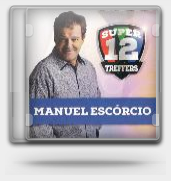 Super 12 Treffers by Manuel Escorcio is now available at Musica. CLICK ON THE CD BELOW TO LISTEN AND BUY. Manuel was admitted to hospital on the 2nd of December 2014 for an operation. He will in recovery for 4 months. See his blog for details on his next show. “After two months of hardly being able to walk as result of back pain, last week I went to see Dr. Johan Nel, the Spinal Orthopedic Surgeon at Pretoria East Hospital. He sent me for X-rays, M.R.I. and also an appointment with Dr. Kritzinger, the neurologist. The results are not good and left me flabbergasted as there is a lot of bone degeneration on my back. By now, I am also beyond Physio therapy. Some of the nerves on my left leg are already dying as a result of the pinching. I will undergo a 6 hour spinal surgery on the 2nd of December at Pretoria East Hospital. If I do not do the op, I can be paralyzed or worse, left incontinent.